Al Fresco chicken sausages are all natural. That means no preservatives. No ingredients that I can’t pronounce. No fillers, no colors, no gluten. See why I’m obsessed? I also just found out that chicken sausage makes a heck of a salad topping. Anytime I can sneak in extra protein without adding tons of fat and calories, you better believe that I am all in for that. I’ve been pretty hooked on the spicy jalapeno chicken sausage thus far but I found a new favorite: sweet apple chicken sausage. It still has a small kick, as sausage should, but it is just the perfect amount of sweet with the apples and a hint of maple. I’m not usually one for combining sweet and savory but I went out on a limb. I added fresh pears, feta cheese, and bell peppers and whipped up a simple curry vinaigrette. I admit I was a little nervous as to how the curry would taste against this odd mix of salad fixin’s but I was pleasantly surprised. The whole thing married perfectly. The tang of the feta helps to bring out the sweetness of the pears. And the curry powder is subtle and adds a surprising element of sweet to the salad. This one quickly earned a spot on our summer meal plan! 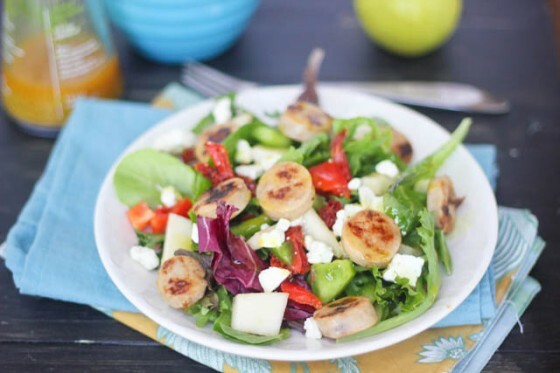 A sweet and savory entree salad: lightly browned chicken sausage with apple and maple; sweet pears, tangy feta cheese and a simple curry vinaigrette that pairs perfectly with the sweet and savory salad. Prepare the dressing by mixing all ingredients until well-blended. Store in the refrigerator until ready to use. Preheat a small skillet over medium heat. Slice the sausage links into 1/4-inch coins and place into the skillet. Cook for 2-3 minutes on the first side until it is lightly browned. Flip each piece and cook for an additional 3-4 minutes until the second side is lightly browned. Remove from heat and set aside. While the chicken sausage cooks, combine the salad greens, bell pepper, feta cheese and the pear. Divide the mixture among two large salad plates. Divide the chicken sausage pieces among the two salads and as desired, drizzle the vinaigrette over the salads. Serve while the chicken sausage is slightly warm. Use any salad dressing you prefer; the curry powder is surprisingly sweet when paired with the apple cider vinegar and pairs perfectly with the sausage, feta and pears. Al Fresco All Natural chicken sausage is widely available but if you can't find it, just substitute your favorite chicken, pork or vegetarian sausage. The bell peppers didn't take away from the salad but didn't really add anything either. Make this salad even simpler by omitting them. Disclaimer: Al Fresco All Natural provided me with free product for this review. I was not compensated in any other way and, as always, all opinions are 100% my own. You see, I have this crazy thing for chicken apple sausage. It’s my FAVORITEEEE! I love it and love everything about this salad. 😀 Yum! Sounds fantastic! Pinned so I can enjoy it for lunch next week. Love this Cassie! I did a twitter party a few weeks ago with Al Fresco for National Garlic Day and I have this sausage in my refrigerator right now. I love it too! I love how you incorporated it into this salad, sounds fantastic! That sounds truly delicious! Have a great holiday weekend, Cassie! Shear heaven! Hope you have a fabulous weekend!! What a great combination of flavours, it sounds like such a delicious salad. Gorgeous salad cassie! LOVE the dressing! I put apple cider vinegar in lots of my dressings, but never thought of curry! Brilliant! Curry has SO many health benefits! Yummy!! That sausage (and that specific flavor) has a permanent residence in my freezer. I absolutely love the stuff. Especially that even when frozen, it can be defrosted and quickly browned up in about 5 minutes making it practical for any meal. Love what you did with the salad 🙂 Have a great weekend, Cassie! sounds awesome! you know i’m a huge chicken sausage fan, too, + this sounds great! This salad looks delish, Cassie! I need to try that sausage! Do they sell it at most grocery stores? pretty! apple chicken sausage is definitely my favorite kind. love the idea to toss it into a salad!! What a gorgeous salad. 🙂 I’ve always wanted to try those chicken sausages. I’ll have to try them out and make this salad. It looks sooo incredibly good! Chicken sausage is the best. I love this, Cassie! What a combo! I love meal salads. I have yet to try chicken sausage, but I think it’s time that I did! This sounds fantastic! 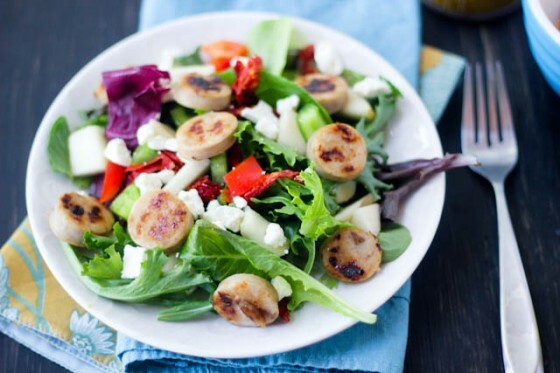 I’m a huge fan of chicken sausage but I’ve never thought to use it as a salad topper – brilliant!! Love the sound of your curry vinaigrette! mmm, i’ve never had chicken sausage in salad before. great idea! i love the feta/pear combo. I got the same package and I’m STILL weeping. Looks so good! Love me some chicken sausage! I can’t believe I have never put it on a salad. Completely brilliant! Have a great holiday weekend! I don’t think I’ve ever heard of chicken sausage before. I may need to go find some now. What a wonderful salad and a great way to incorporate chicken sausage! Yum! I love chicken sausage on the grill! What a fun twist on a salad! I think this sounds absolutely delicious!! This sounds so awesome! I love the idea of a curry vinaigrette! 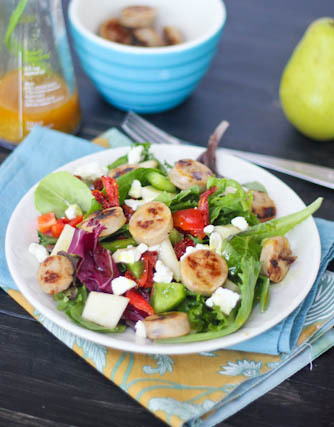 I discovered chicken and apple sausages about a year ago and have been hooked since bite one – this salad looks perfect for the warm Summer days approaching! I’ve never added sausage to a salad…but I’m going to now! How yummy! And perfect for this heat wave!!! Hope you’re having a great weekend, Cassie! I’m a big fan of chicken sausage too – apple being my favorite. Interesting salad combination. I’ll be giving this a try! This is a wonderful salad! I REALLY love this curry vinaigrette!! What a great idea. I love curry but never ever thought of this before. I”m so excited to try this one SOON!!! Have a great long weekend Cassie! I’m totally obsessed with chicken sausage! I’ve had the trader joe’s kind and they’re amazing. I have yet to try an apple version though but it sounds incredibly delightful. And man oh man, I’m totally in love with this salad. The curry dressing sounds to die for! This looks like the best salad EVER! Great flavor combos! Seriously how have I not found your blog until now! So glad I did, this looks fantastic. what a great salad. This is such an interesting collection of ingredients that is sure to create a burst of flavour in your mouth. Great job Cassie! This salad is loaded with flavor! The sausage made the difference for sure! I love chicken sausage! I haven’t tried this apple variety, but what a great idea to put in on a salad. And as for the rest of the ingredients, love it all! Wow! That salad look delicious! I love the idea of a curry vinaigrette. Yum! This looks like the perfect Summer salad. Hearty, fresh, and flavorful! It looks delicious, Cassie!